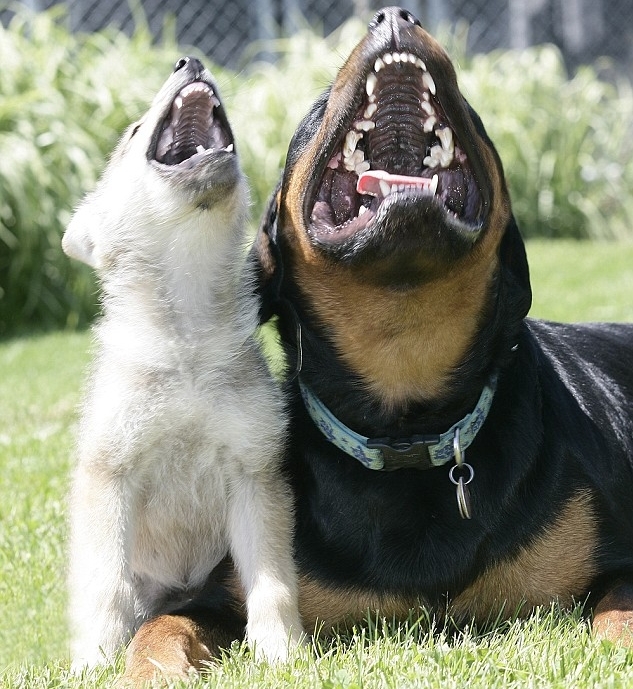 They sleep together, frolic in the sun and even howl at the moon in unison - and their unlikely union brings a smile to the face of everyone who sees them. 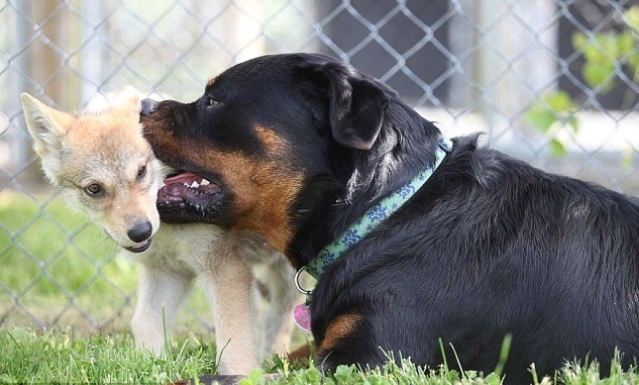 Beldaran, who weighs just five pounds, was adopted by the Rottweiler when she was just four days old at the Kisma Preserve in Mt Desert, Maine, USA, after she was rejected by her parents. Since then the unlikely pair have been inseparable in everything they do. Both are rescue animals and spend all of their time together at the reserve where they are cared for at the centre's sanctuary. 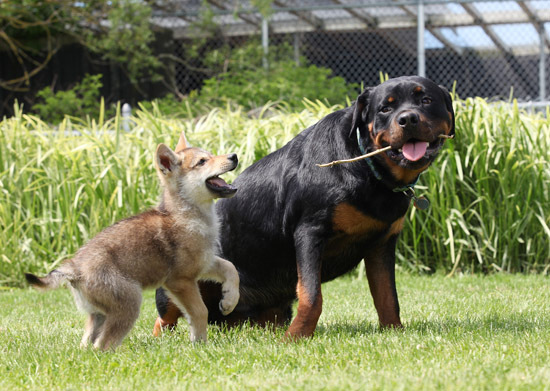 The organisation takes in creatures of all breeds and all sizes. Preserve director Heather Grierson, 49, said: 'It's a true love story that has touched the hearts of everyone who visits the preserve. Beldaran is lovingly described as a 'little accident' by the 12 staff at the sanctuary - who didn't know she was due and believed her rescued parents Gandalf, one, and Kahlani, two, were too young to have babies. Both parents were handed in to the sanctuary when they were young. 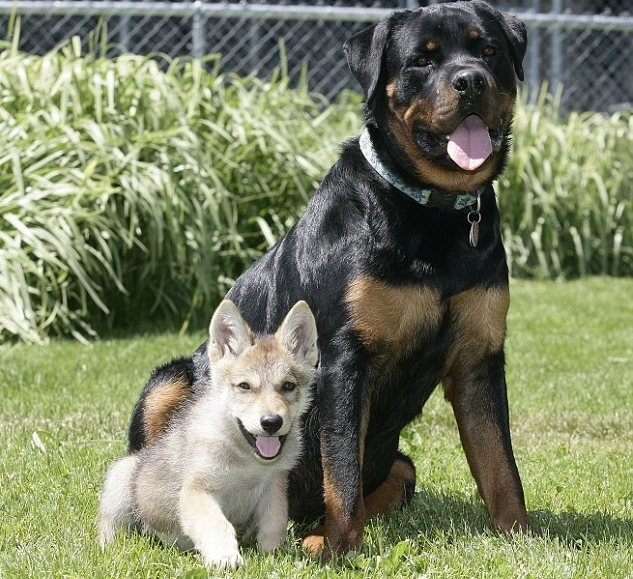 It is thought they had been snatched from the wild for the purpose of breeding them with dogs to make hybrids - a fad in America. 'It causes many problems,' said Heather. 'It's purely for fashion and people don't realise the difficulties of caring for these wild breeds. 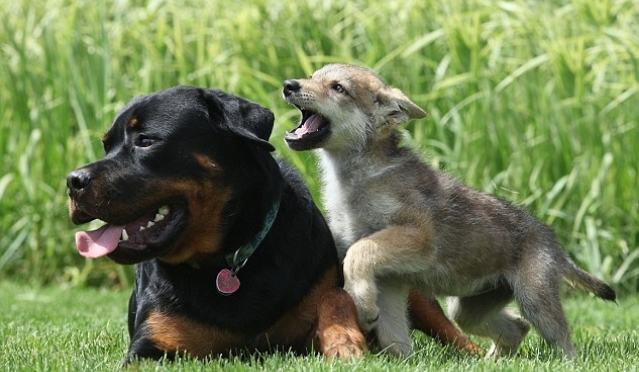 Responses to "Rottweiler becomes surrogate father to a motherless tiny wolf pup"
God Bless you all and of course the daddy Rotty too!